WED: South Sudan urges citizens to protect endangered species UNEP, together with the Ministry of Environment and Forestry, as well as the Ministry of Wildlife and Tourism, celebrated WED on 9 June in Juba, South Sudan. The event gathered representatives of the national government, including the Minister of General Education Hon. Deng Deng Hoc, the Minister of Agriculture and Food Security Hon. Dr Lam Akol and the Minister of Wildlife Conservation and Tourism Hon. Madam Nuno Jemma Kumba. International participants included representatives of the foreign diplomatic missions such as the Ambassador of the United States of America H.E. Ms. Mary Catherine, the Ambassador of Japan H.E. Mr Masahiko Kiya, the Ambassador of the United Kingdom H. E Mr Tim Morris and the Ambassador of France H.E. Mr Jean-Yves Roux. Five tons of ivory and 50 kg of rhino horns as well as confiscated elephant tusks and other illicit wildlife products were burnt on the day to show the South Sudanese government’s commitment to end poaching and the illegal wildlife trade. The government also appealed to its citizens to take a stand against the illegal trade and protect the country’s endangered wildlife species. 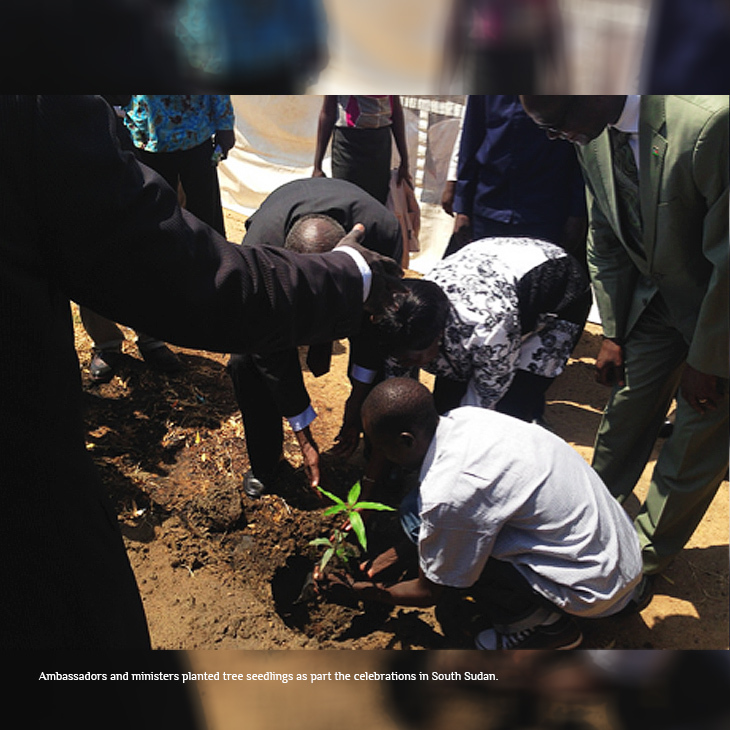 Ambassadors and ministers furthermore planted tree seedlings to mark the celebrations. Other activities included traditional dancing, drama and songs by school students on environmental themes. For more information please write to sophie.brown@unep.org .